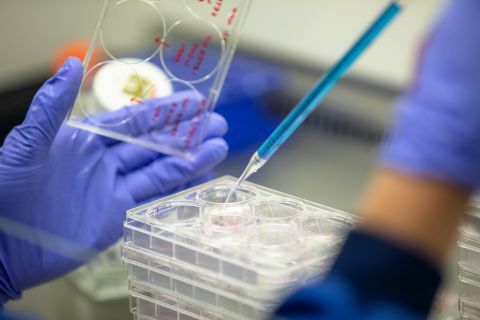 A key aim of the Department of Oncology is the optimal translation of fundamental research into patient benefit and for Oxford to become the leading centre for translational early-phase oncology trials in the UK. Metabolism is at the interface of oncogenic signalling, it is essential for tumour growth and all the Hallmarks of Cancer. Additionally, the local microenvironment is modelled by metabolism, which has major influences on the immune response. Understanding DNA damage and repair mechanisms helps researchers to identify the aberrant processes that drive cancer development and growth. Understanding how the tumour microenvironment affects cancer cell behaviour and how it contributes to a cancer cell’s response to ionising radiation is essential in understanding how to prevent the establishment, growth and progression of cancers and how to exploit the tumour microenvironment for therapeutic gain. Our basic research into genome stability explores how cells repair damaged DNA to prevent cancer. We are also interested in what happens once cancer develops, as it is becoming clear that many tumours are defective in repairing damaged DNA. Our work aims to exploit these repair defects to design novel therapies. A key aim of the Department of Oncology is the optimal translation of fundamental research into patient benefit. Precision cancer medicine brings together the concepts of biological selection of therapy with anatomical and functional targeting of treatment to deliver the best possible outcomes for a patient with cancer. In the Division of Cancer Medicine we are working to further understand the interplay between the immune system and cancer across both cancer development and treatment. Welcome to the The Department of Oncology. The Department of Oncology's mission is to improve cancer care through research and teaching. There is strong emphasis on translation, with established infrastructure to develop scientific insights toward clinical appreciation. The Department houses over 400 staff and postgraduate students - both clinical and non-clinical - and is one of the largest departments in the University of Oxford's Medical Sciences Division. It is also home to the Institute for Radiation Oncology. One of the key aims for the Department is to bring together basic scientific and clinical research groups from across Oxford - based in the Old Road Campus Research Building, the Radiobiology Research Institute, the Weatherall Institute for Molecular Medicine and the NHS Cancer and Haematology Centre - to apply knowledge of cancer and to develop research so that we may better understand how we can combat cancer in the most effective way possible. The mission of the Oxford Institute for Radiation Oncology (formerly the Gray Institute for Radiation Oncology and Biology) is to explore aspects of radiation biology research that could yield new advances in the treatment of cancer. The aims of the Division of Cancer Medicine are to understand cancer and the biological processes that govern how it starts, how it behaves and how the body responds to it.